The U.S. Postal Service's financial woes may get overshadowed in the next few months, as the agency runs dangerously low on cash. The U.S. 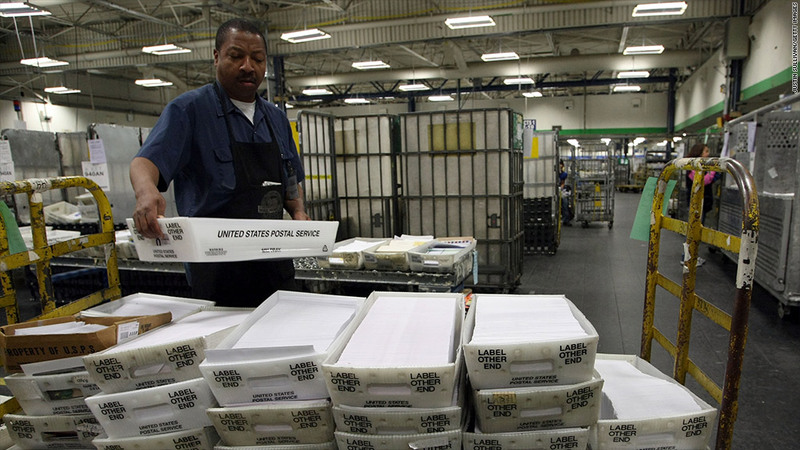 Postal Service is facing its own fiscal cliff this spring. But it is in danger of being overshadowed by bigger fiscal issues facing the nation. When Congress returns to work in less than two weeks, lawmakers will already have a full plate of deadlines on issues that threaten to devastate the U.S. economy -- from raising the debt ceiling, to automatic budget spending cuts that will lead to thousands of federal and private sector job cuts. For the cash-strapped U.S. Postal Service, the cost of being ignored by Congress means that it will be on the brink of bankruptcy. For the American public, it could result in cutbacks on mail delivery. For postal employees, job cuts. The postal service wouldn't say exactly which day its money runs out. But a November financial report warned that the agency will have about $1 billion in cash during one particularly tough period in March -- barely enough to keep the agency running for four days. This situation isn't new. The postal service has been in a financial bind for several years, borrowing billions of dollars from taxpayers to make up for shortfalls caused by a 2006 congressional mandate, under which it has to pre-fund healthcare benefits for future retirees. What has made things worse is that technological advances has also led to a decline in first-class mail, the kind of snail mail most consumers use to either stay in touch or pay bills. Postmaster General Patrick Donahoe said in a statement last week that Congress' "lack of action is disappointing," and he warned that officials would be pursuing a "range of accelerated cost-cutting and revenue-generating measures." In the past year, the Postal Service has cut hours at thousands of post offices -- some are open for only two hours a day. It has also merged some of its plants, which led to a 28,000 drop in its workforce, according to spokeswoman Sue Brennan. All of it was achieved through attrition, which includes retirements and departures by employees who couldn't relocate or take up new jobs. In the last few months, the agency has had enough cash to keep running and pay its employees and contractors due to the influx of election and holiday season mail. The top House Republican and Senate Democrat say they had worked together during the fiscal cliff talks in December, though no resolution was reached on how to save the postal service. "While our approaches have differed in the past, we made significant progress in narrowing our differences in recent months," wrote Rep. Darrell Issa of California and Sen. Tom Carper of Delaware. "Our commitment to restoring this American institution to long-term solvency is unwavering." The statement lacked specificity in details of when, or how, they would achieve that goal. But congressional aides say they're hopeful it'll get passed soon.